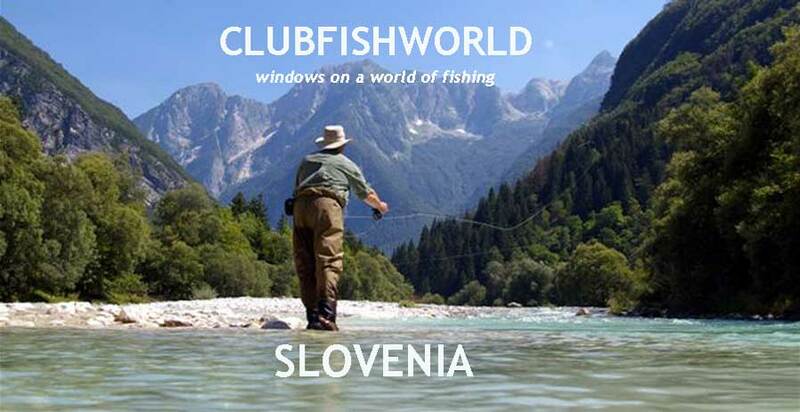 This was a trip I’d been looking forward to for some time; my first fishing holiday with a special bunch of pals in the small but beautiful country of Slovenia, home of the fabled marble trout. Our party: an entente cordial of two French and two English anglers from different walks of life, bound together by a common passion for a sport we seldom get time to enjoy as a group. We arrived from our separate departure points to meet in arrivals at Trieste airport on the shores of the Italian Adriatic. Thirty minutes after being loaded and comforted into the hotel transfer bus, we crossed the border into Slovenia, the sparkling Adriatic diminishing behind, the drama of the Julian mountains looming invitingly ahead. The excitement was palpable. Its amazing how normally rational people can descend into child-like awe at the sight of a newly discovered river. We’d done our research but nothing we’d read or pictures seen prepared us for the reality. What astonishing rivers exist in Slovenia. The waters tumble from spectacular snow capped peaks, absorbing sediment on their journey through immense limestone gorges, thence transformed to a wonderful aquamarine colour of startling clarity. The snatched glimpses of majestic, snaking rivers seen through blurring canopies of roadside forest wetting our appetites beyond famine. Ninety minutes after leaving Trieste we arrived at our hotel in the small town of Korabid at the heart of the Soca valley river system. 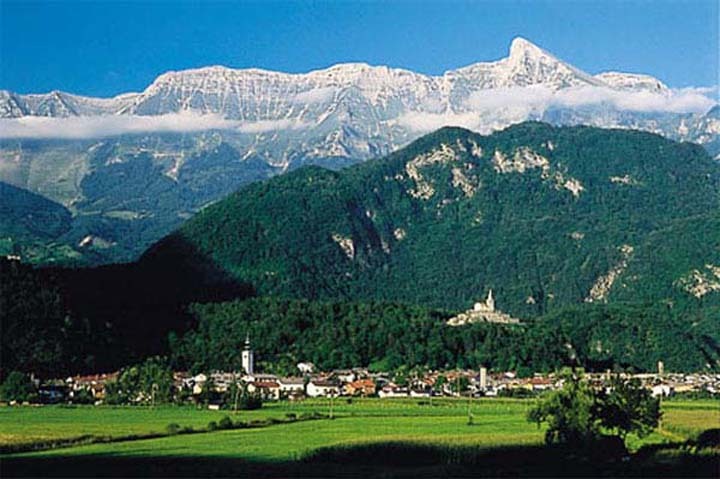 Small it may be, but Korabid has a bloody place in Slavic history as a centre of heroic resistance over two world wars, and the might of the Soca river itself flowing not a 1000 meters from the town centre. This magnificent river starts in the Italian Alps, accumulating Slovenian tributaries like a Roman Caesar; the Nadiza, Idrijca, Trebuscica and Baca swelling its coffers to bursting. Thirty minutes later we congregated at Napoleon’s bridge, staring over the ramparts at the rampaging torrent in the gorge below. It rained heavily the previous week and the river would need another four days to settle to a fishable level. But we knew the tributaries were in fine form, all distinctly different in character and offering a wonderful variety of fishing possibilities. 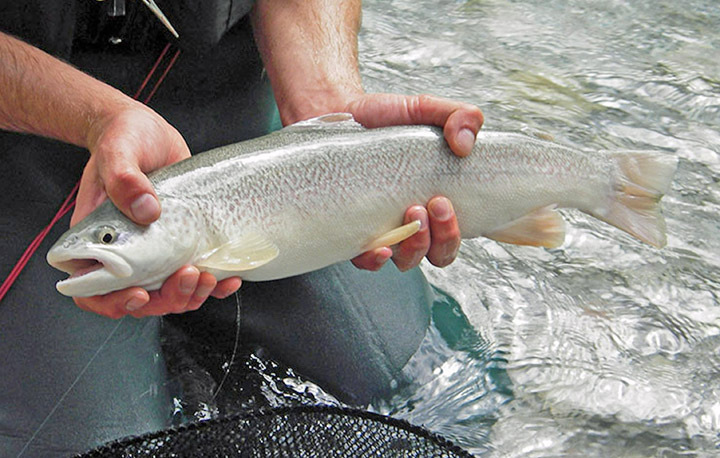 The Soca river system is home to genuinely wild rainbow, grayling, browns and its fabled Marble trout, found nowhere else in the world. Marbles can grow to a whopping 25 kilos, but on average, fish of 50 cm are regularly taken on a daily basis. The rainbows, browns and graylings themselves, no strangers to trophy size. Buoyed by these thoughts and an excellent sea food pasta, not to mention a couple of bottles of fine Slovenian wine, we retired to dream of conquests ahead. We’d booked guides for the first two days, and planned the last two days to explore on own. And right on the button of 8.30 am, our guide, Rok Lustick, arrived in reception. We were to sample three different rivers that day, which would also serve as research for our non guided days. First stop the Nadiza; a broad reach of dramatic free stone river snaking into the distance: sun glittering on gravel runs, topped and tailed by deep holding pools and bordered by rocks and sand bars, and all this set against the magnificent vista of distant, snow capped Mountains. Split into two groups, my English pal Ross and I were allocated the top and tail of a long, deep azure pool. And from our vantage on a boulder ledge, the sight of deep lying fish sending our spirits soaring. Alain and Remy, the French contingent, dispatched to prospect two pools further upstream. Rok counseled a twelve foot leader, supplying tungsten weighted nymphs to be fished under a small foam indicator, Not exactly chalk stream tactics, but this was far from Hampshire and infinitely more dramatic. And under a burning sky, the morning temperature already soaring to a near thirty degrees, the odd circling buzzard anticipating picking at the bones of a desiccated fishermen, we set about our task. The first few tentative mid steam drifts were made and passed unanswered. But after a couple more laid tight to the boulder edge, the indicator’s momentary hesitation heralded an interest. In reaction to my lift, the line plunged to the depths as though tied to the tail of a rocket. My first Slovenian rainbow, and in keeping with their compatriots, what resistance fighters they turned out to be. Over the next two hours, I took eleven fish and missed many more; others in the party taking similar numbers. All rainbow, and although the Slovene associations exercise a limited stocking policy, the greater percentage were wild! I was feeling pretty pleased with myself. The Idrijca was entirely different, hardly a trace of azure, greater overall depth and faster currents. Wading was tricky and the fish lying in swirling seams between boulders. No indication of their presence save Rok’s intimate knowledge of the water. Under instructions: rod held high, line in contact with the flow of a heavily weight nymph, eyes glued to the indicator. And after half a dozen passes through short turbulent runs, success! I’d jumped to Rok’s rule four - nymphing my first marble trout! And another followed, not monsters, but still around 45 cm. Alain prospecting downstream, raising and catching on the dry – 2 browns amongst them. But Rok was keen to show us the last river of the day, so refreshed by a short picnic lunch we set off for the upper Trebuscica. If the previous rivers were about powerful flow and dramatic vista, the Trebuscica was all about intimacy. My beat was settled at the bottom of a small, thickly wooded ravine and canopied in overhangs. Rok directed me up stream. But the river gradient too steep, the water rushing and the available pockets very small. I couldn’t make it work, so back tracked to a flatter, downstream stretch I’d noticed at my drop off. Four highly coloured six inch brownies fell to unweighted nymphs in skinny pockets before Rok and the boys collected me a couple of hours later, with news! Ross, the least experienced fisherman had jumped to rule four – a trophy 6lb genuinely wild Rainbow – he was beside himself with excitement. And the French contingent, yet again, finding calming glides and success for their favoured dry fly. On the journey home, we stopped for a cooling beer at a tin shack bar on the banks of the Idrijca, and needless to say we couldn’t resist a few casts at the odd evening riser dimpling the river below us. That night saw another animated meal on the hotel terrace. And for dessert, Turkey v Croatia in the European Nations Cup’s ultimate 3-2 thriller on the bar’s wide screen TV. What a perfect end to a perfect day - don’t you just love fishing holidays with the boys! If Rok was urbane and treated us as if we knew what were doing. Igor, our guide for the Baca on the second day was a cuddly toy. His demenour inviting you to reveal your fishing inadequacies. It’s all too easy to place yourself in the hands of a guide and just cast to instructions. But Igor’s style of guiding took me below the surface, making me think; inviting me to imagine myself a fish, and where and why to choose my lie. It made me realize I’ve fished so long in the comfort zone of rivers I know well, I’ve simply come to accept where they lie, rather than bother to work out why. Reading rivers is second nature to all top class anglers, but for mere mortals, over familiarity with home waters can atrophy your brain power, and it takes an Igor to regenerate that knowledge. In the afternoon, Ross and I wandered the upstream stretch., Remy and Alain on the lower. The nature of our mile long beat was often the river split into parallel streams, divided by rocky bars, each side its own characteristics. Glass smooth glides and gravel beds, riffling troubled shallows, deep pools with gently shelving tails, then the faster, tricky-to-get-at bouldered waters. My session with Igor had left me feeling that every cast was going to be a winner - there’s nothing like fishing with confidence to bring results. And the treasures we mined that afternoon were hard thought and hard fought for, and all the more gratifying for that (though not so happy when I hooked and lost another fine marble) So thanks for the master class, Igor, and for giving sight back to the blind. Over the final two days, consensus took us back to the Baca and Trebuscica, our favoured rivers. Alain pursuing the quarry with his drys and traditional split cane rod given to him as a lad by his father - Ross and I sticking mainly to the nymph. It’s not often I get a chance to fish rivers where a nymph is king for all seasons and I wasn’t going to waste it. I just couldn’t get enough of these aquamarine holding pools. But truth to tell, I’d peaked early, and this second half of the trip saw diminishing returns. I have to accept that packing on the years brings about lessening powers of concentration, so I guess that’s why I value an Igor so highly - to keep me on my toes. Yet catch I did, and amongst them, some very fine fish. One last, long animated dinner on the terrace and our successful trip was all but at end. But the disappearing mountain views from the mini bus windows on the journey to the airport already whetting appetites for a return. Alain and Remy talking of going back in October for Igor’s favourite sport, early winter grayling - on the dry, naturally.